Welcome to the Luke Cory Trust Website! In February 2008, Luke Cory was a happy 4 year old boy who had just started school. He was diagnosed with AML (Acute Myeloid Leukaemia) and subsequently underwent numerous rounds of chemotherapy, only for it to return on 2 more occasions. 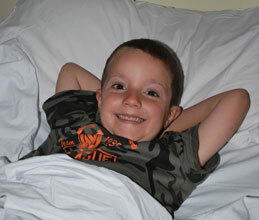 Despite a bone marrow transplant, radiotherapy and all the advances in medicine, Luke tragically died in December 2009. His parents and friends have set up this Trust to give other families with children facing life threatening illnesses a chance of making valuable memories by funding a holiday home at Bunn Leisure in Selsey. Luke and his parents had this chance in the New Forest while Luke was well enough to go and they desperately want other families to have the same opportunity. Bunn Leisure Holiday Park in Selsey was a favourite of Luke’s and the location is close to Chichester Hospital, so children who need treatment or emergency care can be provided for. We thank you for the support you are giving us, and assure you that any contribution, no matter how small, will be carefully used and is greatly appreciated.